Ontario is charting a path back to balance but the Ford government's inaugural budget will keep voters waiting until after the next election before getting the books in the black. Finance Minister Vic Fedeli tabled a budget Thursday with a five-year plan to turn this year's $11.7 billion shortfall into a small surplus in 2023-24. It's only then can the province begin to tackle what has become the world's largest sub-sovereign debt burden at more than $343 billion. The fiscal plan to dig the "province out of the massive hole we inherited," includes "no new tax increases, not one," Fedeli said during a news conference Thursday. It does lay out almost $4 billion in increased program spending over the next three fiscal years, not necessarily the austerity budget feared by the opposition. That includes modest increases for health and education, albeit at rates below expected inflation. There are outright expense decreases for post-secondary education and training, children's and social services programs, and the justice sector over those three years -- with the government vowing to find efficiencies in those sectors. Are you confident Ontario’s government can balance the books? And the province's debt-to-GDP ratio remains stubbornly above 40 per cent through the fiscal 2021-22 year. There's also a pledge to match Ottawa's measures to let companies write off capital investments faster. Fedeli says the Ontario Job Creation Investment Incentive will provide Ontario businesses $3.8 billion in tax relief over six years. While the Ford government campaigned on a pledge to balance the books, the minister defended the five-year wait for a return to black, saying the plan is "protecting what matters most in a reasonable and thoughtful manner." 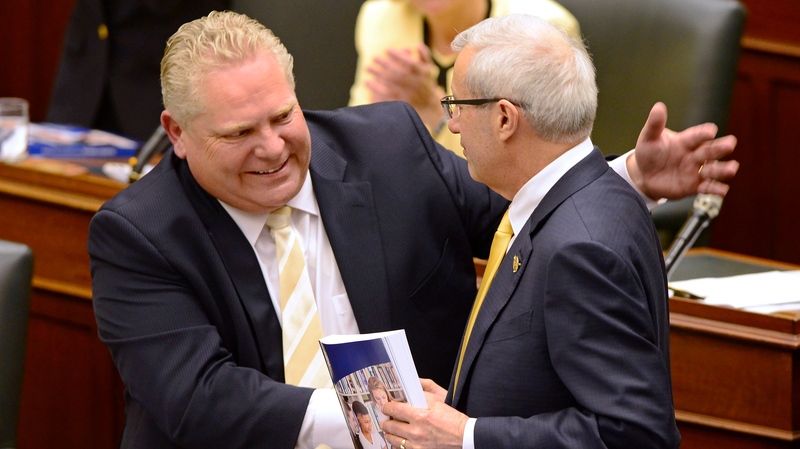 And when asked why he didn't deliver on a campaign promise to cut the corporate tax rate, Fedeli replied, "we've done something that's a lot better." "This is what [business leaders] wanted," Fedeli said of the accelerated capital write-offs, which the government says will take the marginal effective tax rate for Ontario business down to 12.6 per cent from 16 per cent. "This is what they needed now." The budget also proposes a fiscal accountability act that calls for both the premier and the finance minister to give up 10 per cent of their salaries if they fail to report annually on their progress to tackle the debt. For parents, there's a new tax credit for childcare with a focus on low- and moderate-income families starting with the 2019 tax year. It's worth up to $6,000 per child under the age of seven, and up to $3,750 per child between the ages of seven and 16. For low-income seniors without benefits, there's a new dental program to access services in public health units. And the budget also has a lot to say about alcohol. That includes letting sports fans drink at tailgating parties, allowing cities to decide if people can consume in parks, extending hours of alcohol service at bars, restaurants and golf courses, and changing rules to allow "happy hour" advertising. There's also a new colourful blue licence plate coming to the province, a move NDP Leader Andrea Horwath dismissed as Conservative party branding that puts Premier Doug Ford's "ego on the back of everyone's car." "I think it will cause a lot of rear-ending," she quipped.